Photo by Norm Copeland. Used under a Creative Commons license. I have some Life Lists here on my blog (though I see they need to be reformatted). Things I have done, things I have done and never want to do again (the Raven Life List, because “Nevermore”) and museums I have visited. How about Things I Never Want to Do? An “Out of the Bucket” List. 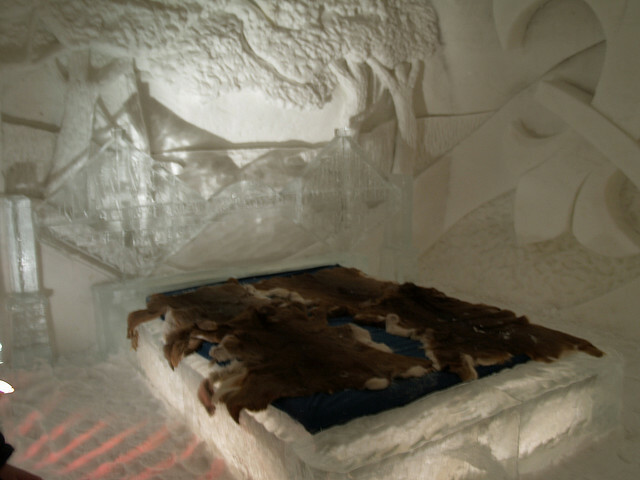 See above: Spend the night in an ice hotel. It is pretty, isn’t it? But make no mistake: THAT IS ICE. Or at least compressed snow. I do not care about the difference, because frozen is frozen in my book, and I do not want to be frozen. Eat a sea urchin. The look on my sister’s face after she tried Uni was enough to convince me that I did not need to. Go to a rave. I love to dance and I love to do it in a crowd, but I fall asleep by 10 pm and I need earplugs at Zumba, so, no. Go on a cruise. I’m a germaphobe, I don’t like buffets, and I like to spend more time in each destination. Plus? Two words: Poop cruise. Have another cat. Been there, done that, woke up with them batting my nose one too many times. They’re cute. They’re furry. They belong somewhere not at my house. Wear high heels. I fell off my foot wearing athletic shoes in Zumba yesterday. High heels I need like I need a loaded and cocked revolver in my purse. Get anything below my chin waxed. You already know how I feel about this from the early days of blogging, remember? Skydiving. Don’t jump out of a perfectly good airplane is advice I have heard and heeded. Ride a motorcycle. Been there, done that, too old. I like having a hunk of metal and plastic between me and the road. Shop on Black Friday. Shopping is painful under the best of circumstances. I’m a get in and get the heck out kind of girl. There’s nothing fun about that stuff to me. I’ll be eating leftovers and watching Netflix. Happy Holidays to you, too. (Now Cyber Monday – that’s a different thing altogether). What about you? What is off the list? Definitely agree with you on the Black Friday thing! My friend says she finds it invigorating. Extroverts are weird. 1. I never want to drive across the country again. I’ve done it East to West and North to South. So done. 2. Agree about the cruise, except to add, I don’t enjoy crowds of people. Certainly don’t want to be on a big boat with thousands of them that I don’t know while staying in a tiny room. 3. Run a marathon of any sort. 4. Go camping again. Way past that for about a billion reasons. 5. Ski. Snow, chapped lips, freezing your rear end off. Lived with that for 30 years. I’ll watch it on the Olympics and be perfectly content. Plus, already broke my leg once. Why risk a replay? I forgot about camping. Me neither. I go to the bathroom 2-3 times a night, and I hate having to get up, unzip bag, unzip tent, walk through night…no.